While promising in the short term, WRIA 8 Chinook salmon returns are not yet to a level that would allow a local fishery or signal sustainable populations. 3 NOTES ON ABUNDANCE: 1) Abundance (escapement) data for 2015 are provisional and subject to change. 2) Abundance estimates are provided by WDFW. The general approach to conserving Chinook salmon in the Puget Sound region is the Viable Salmonid Population (VSP) concept. A viable salmonid population is defined as an independent population with a negligible (less than five percent) risk of extinction over a 100-year period. WRIA 8 supports two distinct Chinook populations: the Cedar and Sammamish populations. Each population has its special challenges and needs, and recovery priorities differ. The attributes used to evaluate the status of Chinook salmon are abundance, population productivity, spatial distribution, and diversity. 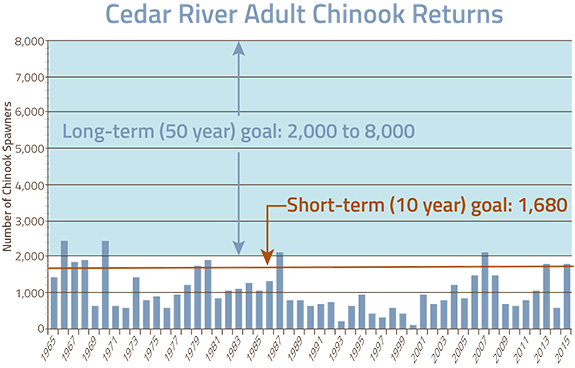 Our short-term (10-year) goals for Chinook salmon in WRIA 8 were meant to stabilize both populations and improve measures of abundance, productivity, spatial distribution and diversity. Long-term goals are intended to keep Chinook populations in our watershed at sustainable, harvestable levels. While some short-term indicators are meeting—or approaching—our 10-year goals, we are still short of this long-term objective. Adult abundance is measured by counting the number of adult salmon that have escaped all other sources of mortality to return to their natal stream to spawn (i.e., "escapement"). Abundance goals for Chinook salmon in WRIA 8 were adopted in the WRIA 8 recovery chapter in 2005. These and other goals were further refined in the 2008 WRIA 8 "H-Integration" process, which brought together local hatchery, harvest and habitat managers to improve coordination among these three principal factors affecting Chinook recovery in the watershed. 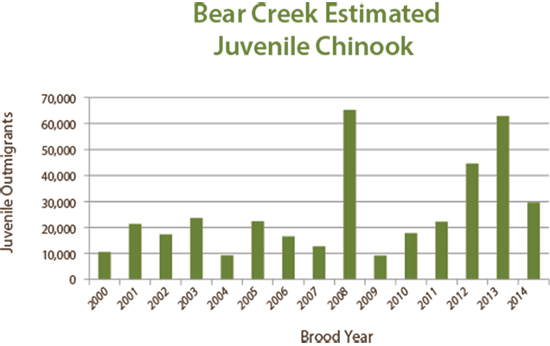 The 10-year WRIA 8 abundance goals were 1,680 and 1,083 adults returning each year to the Cedar and Sammamish populations, respectively.1,2 The average returns for those populations for the last 10 years (2006-2015) are 1,250 adults for the Cedar3 population and 1,337 for the Sammamish population. While promising in the short term, these returns are not yet to a level that would allow a local fishery or signal sustainable populations. The number of juvenile Chinook salmon migrating downstream is estimated each year at fixed locations in Bear Creek and in the Cedar River. This estimate is performed by WDFW during the juvenile migration period, usually between late January and mid-July. The information is posted online in an annual report. WRIA 8 does not have a numeric goal for juvenile Chinook abundance, though related goals for egg-to-migrant survival (juvenile productivity) and fry vs. parr proportions (life history diversity) use juvenile abundance data to arrive at estimates. The total number of juvenile outmigrants from the Cedar River and Bear Creek has increased substantially since 2005. While specific cause and effect is difficult to prove without a costly monitoring and research program, recent effectiveness monitoring of Cedar River projects (pdf) by King County suggests that overall conditions supporting juvenile production in the Cedar River have improved since 2005. Juvenile productivity reflects habitat factors within the control of WRIA 8 partners—for example, watershed hydrology and juvenile rearing habitat quantity and quality. Therefore, WRIA 8 considers juvenile productivity a more useful indicator of progress for local plan implementation. Productivity indicates whether a population is growing or shrinking over time. Given the very low overall abundance of Chinook salmon in WRIA 8, high productivity is necessary to restore the population to historic, harvestable levels. Overall Chinook productivity is influenced by factors throughout the full salmon life cycle— including elements outside the control of WRIA 8 jurisdictions, such as marine survival. Juvenile productivity, however, reflects habitat factors within the control of WRIA 8 partners—for example, watershed hydrology and juvenile rearing habitat quantity and quality. Therefore, WRIA 8 considers juvenile productivity a more useful indicator of progress for local plan implementation. Adult productivity is assessed and reported by the NOAA (National Oceanic and Atmospheric Administration) Fisheries Science Center, generally at five-year intervals. The last official assessment was performed in 2011 (pdf), and a new assessment is due in early 2016. WRIA 8 uses egg-to-migrant survival as its primary indicator of juvenile productivity. Egg-to-migrant survival is the estimated number of young salmon migrating from streams to Lake Washington divided by the estimated number of eggs deposited. The 10-year egg-to-migrant survival rate goals for WRIA 8 Chinook were set at 13.8% and 4.4% for the Cedar and Bear populations, respectively. The average egg-to-migrant survival rates for the last 10 years (brood years 2005-2014) are 24.0% for the Cedar population and 8.8% for the Bear population, which meet our present short term and long-term goals. WRIA 8 Chinook egg-to-migrant survival. Survival is estimated at Bear Creek and Cedar River traps (i.e. does not incorporate survival through Lake Washington or Ship Canal). Data source, WDFW. The distribution of a population throughout a landscape provides an insurance policy against localized catastrophes, such as floods or landslides. WRIA 8 salmon populations have a greater chance of long-term survival if they are able to spawn and rear successfully throughout the watershed and not just in one stream. A healthy population can colonize nearby basins in times of high abundance. During periods of low abundance, however, a small, widely-dispersed population may mean returning adults cannot find a mate. In WRIA 8, the 10-year goal was to maintain and (where opportunities existed) increase the spawning and rearing distribution of Chinook salmon throughout the watershed. Annual spawning ground surveys indicate increasing use of the Cedar River above the Landsburg diversion dam since creation of a fish passage facility there in 2003. Removal of the Issaquah Hatchery Dam in 2013 improved fish passage on Issaquah Creek and will likely increase use of habitat in the upper reaches of the creek. 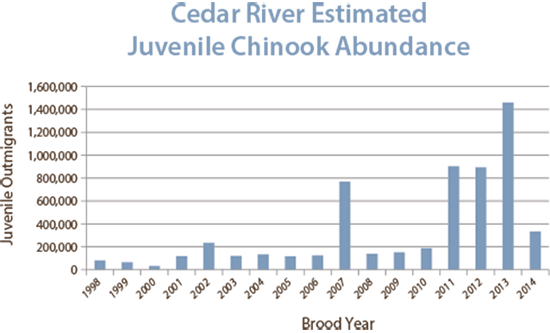 Elsewhere in WRIA 8, with the exception of Kelsey Creek, Chinook spawning has been highly variable since surveys began in 2000. 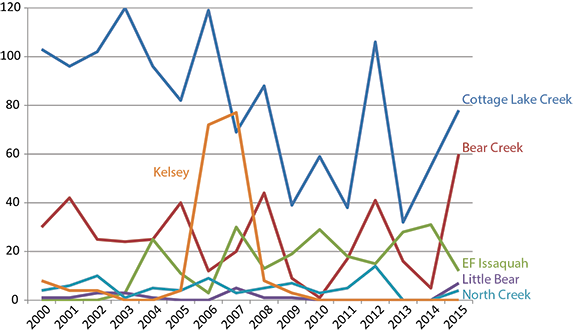 The number of Chinook salmon has declined precipitously in Kelsey Creek after two very strong years in 2006 and 2007. It is unclear what contributed to the strong runs there in 2006 and 2007 or led to the absence of returning adults in recent years. 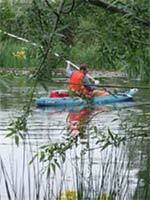 "NS" represents years in which those tributaries were not sampled. (Data source: King County, WDFW and Seattle Public Utilities). In WRIA 8, we monitor population diversity by tracking the proportion of juvenile salmon outmigrating as fry (early) or parr (later), as well as the proportion of hatchery fish on the spawning grounds. WRIA 8 goals are to increase the proportion of parr migrants on the Cedar River, and to decrease the proportion of hatchery-origin Chinook spawning with natural-origin fish in local streams. 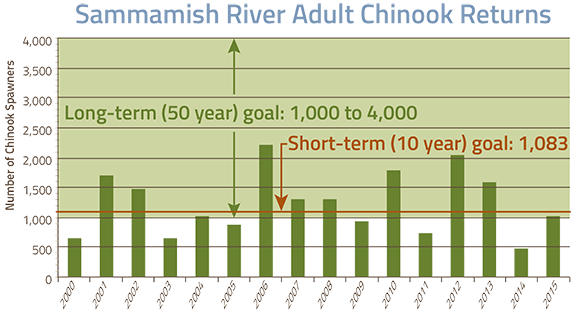 On the Cedar River, the 10-year goal was to increase the number and proportion of parr (late-season) outmigrants. However, fry migrants have driven the overall increase in juvenile migrants in most years and the average number of late-season outmigrants has actually decreased. Data from WDFW suggest that a lack of sufficient freshwater rearing and flood refuge habitat continues to be the most important factor limiting the production of parr migrants on the Cedar River. This information confirms our primary conservation hypothesis from 2005, and suggests that our 2005 goal of increasing freshwater rearing/refuge habitat in the Cedar River is still a top priority. Rearing and refuge habitat is mostly improved by setting back or removing hardened streambanks and reconnecting floodplain habitat, complex projects that take years to become effective. We expect that over time, as more of these larger projects mature and more rearing/refuge habitat is restored, the number of parr migrants will increase. Much research indicates that hatchery-origin salmon “straying” into local streams and spawning with natural-origin fish can reduce the overall genetic diversity or fitness of the natural stock. This is complicated in WRIA 8 by many factors, including the long history of the hatchery in the watershed (the Issaquah Salmon Hatchery has been in operation since 1936) and the historic practice of releasing hatchery Chinook into streams throughout the watershed each year until fairly recent times. Notwithstanding this complexity, the WRIA 8 H-Integration group agreed to a near-term (10-year) goal of no more than 20% hatchery Chinook on the Cedar River. The group agreed to an interim goal for the Sammamish Chinook population to maintain or decrease the proportion of hatchery-origin fish in the natural population. Both of these goals were intended to be met by improvements in habitat raising the proportion of natural-origin Chinook. For the Cedar population, the current 10-year average of hatchery-origin Chinook on the Cedar River is 20%. The last two years have seen an increase in the proportion of hatchery Chinook on the Cedar, coinciding with two hot and dry summers. We speculate that hatchery Chinook that normally would have gone up the Sammamish River and to the Issaquah hatchery chose the cooler Cedar River instead. The Sammamish population hatchery proportion has averaged 90% over the same 10-year period.